Defenders Epic Collection: The New Defenders review: A forgotten gem from decades past – AiPT! An overlooked gem from a bygone era. At roughly 500 pages each, Marvel’s Epic Collections are the company’s best publications in terms of reprinting decades-old comics. One of the line’s latest books, Defenders Epic Collection: The New Defenders, is out this week. This volume collects one of the strangest eras of one of Marvel’s strangest teams, with a roster that makes even the Champions look cohesive. Beast, Valkyrie, Iceman, Moondragon, Cloud, Gargoyle, and Angel? Talk about an odd line-up! In addition to New Defenders #126-137, this volume also includes the early ’80s Iceman and Beauty and the Beast miniseries in their entirety. This is definitely a unique volume, but is it good? Perhaps the most notable aspect of New Defenders is how well the team members’ interpersonal relationships are handled. While action and suspense can be found in any solo superhero book, team books have the added attraction of being showcases for entertaining character dynamics. J.M. 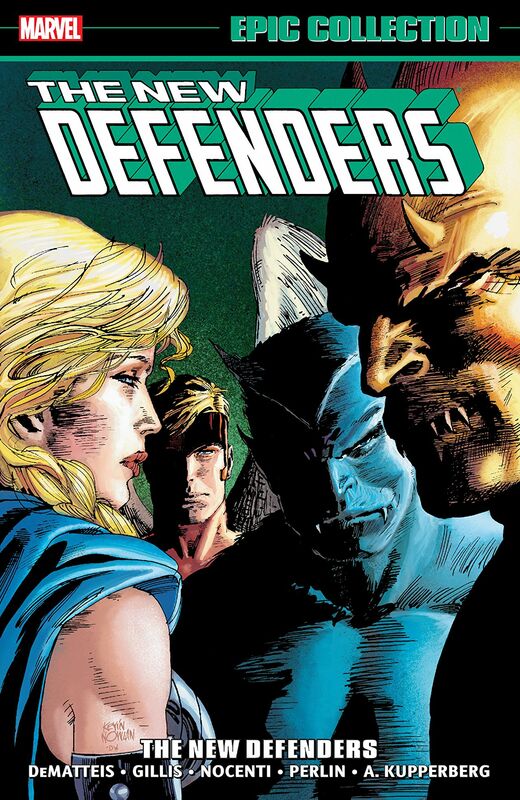 DeMatteis and Peter B. Gillis (the writers for the majority of this volume) clearly understand that, and they imbue each Defender with a unique personality that helps keep their contributions to the roster unique. Angel, for instance, is the rich and confident pretty boy. Iceman and Beast are both comedic relief, but Iceman’s humor contrasts his deeply held anxieties, whereas Beast’s compliments his fascination with all things academic. The most standout member of the team is definitely Moondragon, who serves up bitchy telepath shtick so well even Emma Frost doesn’t compare. With that said, it’s not enough for the characters to be well-defined in and of themselves. They also have to have constantly growing and shifting rapports with one another. DeMatteis and Gillis do a fantastic job developing the Defenders’ friendships over the course of this volume. The majority of Moondragon’s relationships are tense and antagonistic, and several of her teammates find themselves struggling to reconcile her cold-hearted nature with the romantic attraction they feel for her. Cloud, meanwhile, is at the center of some unexpectedly poignant and serious plot developments. Cloud switches between male and female forms, and each of their fellow Defenders responds to this differently. The last thing I expected from New Defenders was a careful addressal of how non-binary people navigate social spaces, but Gillis delivers just that in the volume’s final issues. Besides its excellent character work, New Defenders impresses with polished comedic timing and delightfully dramatic narration. The characters’ bantering is frequently hilarious, and a number of pop culture references are effectively integrated throughout. The volume’s funniest issue is perhaps one in which the team finds themselves up against an incompetent villain called the Walrus, who is only defeated thanks to the help of the even more incompetent Frogman. Moments like this are as frequent as they are silly, and help keep the series lighthearted. The narration, meanwhile, succeeds in the opposite direction. The drama of DeMatteis and Gillis’s captions is played totally straight, and it works. The writing is poetic in the best sense of the word, and it helps to up the sense of stakes considerably. As far as its non-New Defenders content goes, this book is a mixed bag. On one hand, the Iceman miniseries is shockingly excellent. Fans of the character’s recent series will find similar themes about anxiety and family here, all of which are handled poignantly. Beauty and the Beast, meanwhile, fails to accomplish much of anything. Some interesting ideas about the quest for fame are brought up, but the pacing is wonky and the titular characters’ deep love for one another feels inadequately built up. This volume also includes some bonus content in the form of letters page excerpts, advertisement and pin-up reprints, original line-art, and columns from Marvel Age. These extra glimpses of the comic scene from over thirty years ago are a real treat, and they help add cultural context for the book. This volume is also good art-wise. The main pencilers on the New Defenders issues are Don Perlin and Alan Kupperberg. They do equally good jobs of conveying comedy and personality through the characters’ body languages, and their action scenes aren’t anything to scoff at either. With that said, the most memorable images in this book are drawn by Kupperberg in the Iceman miniseries. Bobby’s internal and external anxieties are beautifully conveyed through his facial expressions, and the series’s high fantasy villains and backgrounds are pleasing to look at. There are definitely some scenes and characters in this volume that look blander than others, but the artwork is always at least solid. Overall, Defenders Epic Collection: The New Defenders is an unexpected and forgotten treasure from the world of ’80s Marvel Comics. The Defenders have long been resigned to obscurity, perhaps no more evidently so than in this iteration of the team. With that said, the various creative teams in this book successfully take a strange assemblage of C and D-list characters and craft A-grade adventures with them. Some issues are less charming than others, but as a whole this volume is one not to be missed. A fun and forgotten chapter from Marvel's past with compelling characters and fantastic comedy.